Launching The Dancing Soul's Virtual Studio on Powhow! I can’t even begin to tell you how excited I am to be announcing this! I’ve been hard at work trying to make this happen, figuring it all out, and getting approval! It’s here, my virtual studio at Powhow. You can now take group MELT Method classes with me live online!! That makes me so happy to type!! 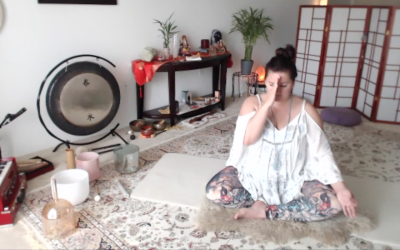 I’ll soon be adding beginning yoga and meditation classes as well, and all of this happens live from the convenience of your own home!! I have an extensive class schedule up now Mon-Thurs. I’m open to suggestions if you have a certain day or time you would like. It will be a continual process of tweaking to see what date and times work best, but let’s start it and see what happens! I know right? It’s incredibly exciting! I’ll also say, Powhow is really cool! Its free to join, you can learn just about anything, cooking, fitness, music lessons, and now MELT Method and self care classes with me! Check it out, let me know if you have any questions, and I’ll see you in class – from my home and heart to yours, let’s make 2016 a year of self love and self care! So much love and light to you all!! !